Perhaps that six year break wasn’t long enough. What’s on offer here? More of the same, is the easiest answer, after an ominous Intro piece Vratyas and hired hands breaking into Where His Ravens Fly, a folk rock jig with chanted male vocals that gradually builds the grandiosity up into a pleasant singalong – a bit too long at over seven minutes long, but enjoyable enough. Falkenbach seem a little too eager to fall into repetitive song patterns – Time Between Dog And Wolf, for example – yet when the songs are actually allowed to do something they’re quite fantastic, as Tafana’s flute-imbued catchiness shows. 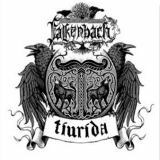 The major weakness of Falkenbach’s sound is that it gets boring pretty easily. Still, the likes of Runes Shall You Know are easy to appreciate, nicely epic and tuneful, quite pleasant to listen to –only two songs have harsh vocals, but even they avoid any pagan/black metal heaviness and focuses on the melodic swing of the rest of the album. This must be the lightest Viking Metal album I’ve ever heard – Amon Amarth fans should most definitely look elsewhere for heaviness. To be honest, I’ve always been somewhat surprised at Falkenbach’s high standing amongst folk-inclined metalheads, the band never delivering on their promise from what I’ve heard. It’s probably a good job that Tiurida is only forty minutes long, as more would really expose the weaknesses at the band’s heart, melodies getting recycled to a real level of obnoxiousness. Tiurida is pleasant enough and will be much appreciated by those who enjoy acoustic plucking in their folk metal, but lacks that killer ‘voice of the people’ vibe that makes bands such as Arkona genuinely brilliant. Good, but easily skippable.